Dan Pearson, CFCA’s director of international operations, was at the Hermano Pedro project in San Lucas Toliman, Guatemala, when Tropical Storm Agatha hit. Dan will continue visiting projects in Guatemala and helping staff assess damages from the storm. The following is Dan’s experience this past weekend. We ended up receiving 150 people last night. Some of them are from around here and have lost their homes or were evacuated, others got stuck in San Lucas when the roads were blocked, and some were from a bus that slid off the road during the rain. This morning the rain has stopped, and the clouds briefly cleared enough to see the volcanoes behind the CFCA center. We could see at least half a dozen mudslides on the volcano closer to us. Then the clouds came back. The radio says the worst of the rain will start early tomorrow morning and run all morning. They are also reporting that already some of the rivers around here are running higher than they were during Hurricanes Stan and Mitch. Some people who had been separated from their families left on foot this morning to find their families. Others took advantage of the break in the rain to try to get to the houses of relatives or check on their homes. Everyone is afraid of having their things stolen while they are away. We still have at least 100 here. The city said they would bring food for them this morning, but nothing has arrived yet. We made coffee for everyone, and Brother Jorge (Hermano Pedro project coordinator) is now cooking some porridge for them. Actually, some of the mothers are cooking the porridge because none of us knew how to make such large quantities, and we didn’t want to ruin the batch. After the devastation of Hurricane Stan in 2005, the Hermano Pedro project implemented the practice of holding two quetzales (about $0.25) per child per month for disasters like this. That fund will be used for immediate response. Because this storm has hit some parts of the country where CFCA has a lot of sponsored children, it is likely many have been affected. Unless the weather clears up considerably, we probably won’t know until at least mid-week how many sponsored families are affected or what the exact damage is. Some of the Hermano Pedro staff live in different parts of the country than where they work. The storm hit on the weekend, so some of those staff members will have difficulty just getting back to their subprojects with so many roads blocked by mudslides. We heard that the costal route from San Lucas to Guatemala City is closed indefinitely because a bridge was washed away. Other routes in and out are also blocked by mud, rocks and trees. I don’t think it’s possible to get to Guatemala City from San Lucas at this time. Read more about the storm. Sponsors and others wishing to help may donate to CFCAís Disaster Assistance Fund. One hundred percent of donations to this fund are sent to CFCA projects to help individuals and families affected by disasters. Funds donated are used where they are most needed, and CFCA retains discretion as to the use of the funds. In addition to emergency relief, contributions may be used for long-term assistance. Wow … we just got back from our mission awareness trip to Guatemala a couple of days ago. (ìWeî being my parents, a group of teens and adults from the Church of the Risen Christ parish in Denver, Colo., and myself.) Before we left, I thought about what I wanted to get out of the trip. I really had no idea what to expect, except that we were going to be going to a very poor country, and I wanted to keep an open mind so that I could experience everything to its fullest. In the end, I decided that my goal was to see how different cultures interact with each other, as well as to learn about the culture and people of the country. I had no idea what an eye-opening, educational and wonderful experience this trip would be! After we arrived in Guatemala City, we drove about three hours to San Lucas Tolim·n. During the drive, it was almost a culture shock going from our air-conditioned houses in Denver, to seeing banks guarded by men with guns in Guatemala City, down to the little shacks that people call home in each of the cities we passed. 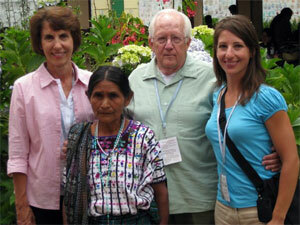 The staff at CFCA in San Lucas Tolim·n was extremely friendly and accommodating to our group. They made us feel like one of the family at once. On our first day of work, we took a boat to Santiago Atitl·n, the city where we helped build a house. Walking up the streets of Santiago and looking at all of the stores and homes, I realized just how poverty-stricken the country is. At the same time, I realized how incredibly wealthy the people are through their relationships with their families and with one another. Back at home, itís so easy to get attached to your Blackberry, iPod and other gadgets that you neglect your relationships with the people around you and with your family. One thing that really stood out to me was that everyone was so incredibly happy even though they had little money and next to nothing by ways of physical possessions. What they do have is an exceptionally deep understanding of how their communities work, as well as a connection with the people around them. When I was packing my suitcase at CFCA in San Lucas Tolim·n, I was truly embarrassed by the amount of physical possessions I had in one suitcase. While packing for the trip, I was fretting about which pair of pants I wanted to sacrifice as work pants. After being at the work site for four days, the pants I wore really did not matter. What did matter is that I spent an invaluable amount of time with my parents. 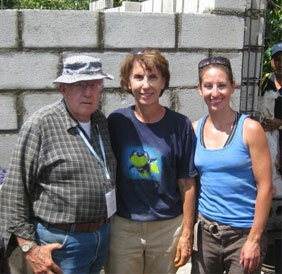 Cassie and her parents standing outside the house they helped build in Guatemala. I also realized that happiness does not depend on the newest electronic device that I just bought. Happiness is strengthening the relationships around me. This trip has really got me thinking about the amount of ìstuffî around my home that I do not need. In the next couple of months, my goal is to purge myself of things that I donít need and donít use. Also, I really want to strengthen my relationships with the people that mean the most to me.